I tried finding more info but was unable to, therefore I'm posting this. Little background, I'm familiar with overclocking and have been doing it last 15 years. I was able to reach Winbond BH-5 to 295Mhz 2-2-2-5 4.0V on a DFI NF4 back then. HyperX Predator Black 16GB 4000MHz DDR4 CL19 DIMM (Kit of 2) XMP (HX440C19PB3K2/16) - I know they're not QVL. I'm unable to POST on SPD1 (3600Mhz) or SPD2 unless setting relaxed timings/subtimings before hand, and then enabling SPD. Even if booting, 3600 or 4000mhz is never stable with main timings as advertised. 4000Mhz is not working even at 19-20-20. How can I identify if whether I have a weak IMC or if the RAM has to be RMA'd? You may have a weak IMC but I would say your biggest problem is the Gigabyte MB and it's crap BIOS. See if you can find someone who has posted a high frequency RAM OC on that MB and try copy there sub timings exactly. To find out if the RAM is faulty test one stick at a time if one stick can hit it's rated speed and the other can not you know you have a dud. I did, with Buildzoid's guide on that particular Motherboard. Besides 3600~4000Mhz is not that high. I'd understand not being able to hit 4400+ heh. 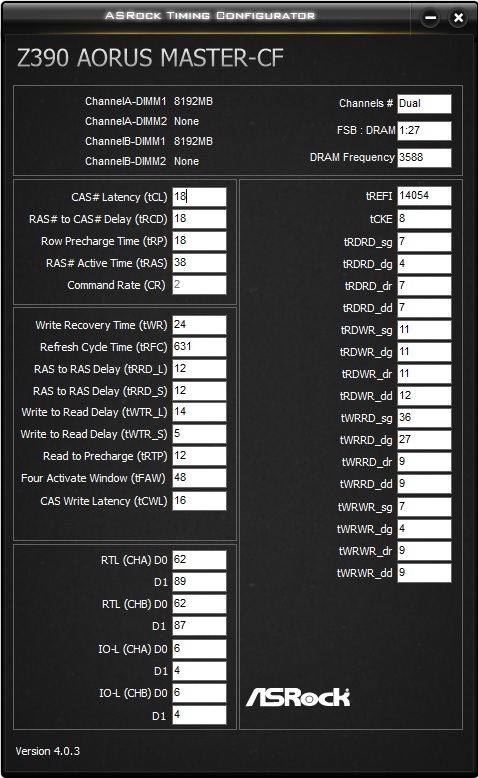 Show us your timings at your highest obtainable frequency with ASRock timing config. It could be the IMC. I would post in the Z390 Aorus thread as we have a lot of people in there that are great help. @Dasa what is wrong with the bios on the Master? I know they have come along way from how they used to be and are always looking for input to help them get better. At least the OP didn't get stuck with any of the Asus trash. Haven't used gigabyte myself for some time so I could be wrong but more often that not when I see people having problems reaching high memory speeds it is with a Gigabyte\ASRock MB and the BIOS seems to be getting the training wrong for the RAM kit it is using. While ASUS high end MB seem to be more likely to get it right and although ASUS VRM may not be as good provided they have some airflow they seem to do there job just fine even if they use a bit more power. Your tRDWR seems tighter than most at 11-12 so it may be worth trying them at 16. Last edited by Dasa; 03-25-2019 at 03:51 PM. Thanks. I'll set it to 16 and set main timings to 17-18-18 which fails within 10min or Karhu. Q1: Did you have to use F7a because other BIOS' would fail? Q2: Do you have a screenshot of all your timings? What VCCIO/SA? Any other trick?